Cleveland Public Library and the Ohio Center for the Book present “Coffee and Comics,” comics-making workshops hosted by Rising Star Coffee. Join these comics creators at the Rising Star Coffee for free coffee and instruction! The workshops are open to all ages and skill levels. Please bring sketch pads and drawing materials. Making Comics with Cleveland’s Vagabond Comics Creators. Vagabond Comics is an all-ages, independently published comics anthology created in 2015. Much like a campfire serves as a gathering place for the wild tales of ragtag travelers, Vagabond aims to provide a storytellings platform for a diverse collection of voices and artists. Sequoia Bostick is a freelance illustrator and designer living in Cleveland, Ohio. By day she teaches art to kids of all ages as a Resident Teaching Artist. By night (and sometimes part of the day) she creates crafts for kids, draws comics, and runs Cleveland’s own all-ages comic anthology Vagabond Comics. She graduated from the Cleveland Institute of Art with a BFA in Illustration in 2014. Amalia DeGirolamo is a Cleveland-based illustrator and designer, and is the co-creator of the Vagabond Comics anthology. Her work encompasses apparel, children’s products, comics, and more. 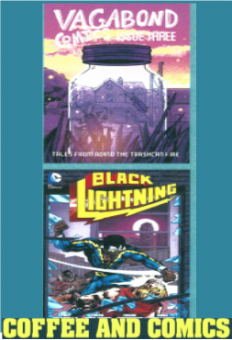 Tony Isabella, born in Cleveland, Ohio, is the American comic book writer, editor and artist who created DC Comics’ first major African-American superhero Black Lightning, as well as Marvel Comics’ Black Goliath, Black Lightning, a new CW TV series, premiered January 16, 2018, based on Isabella’s character. In this workshop, Isabella will focus on the creation of character development in comics, and especially on the evolution of core values.